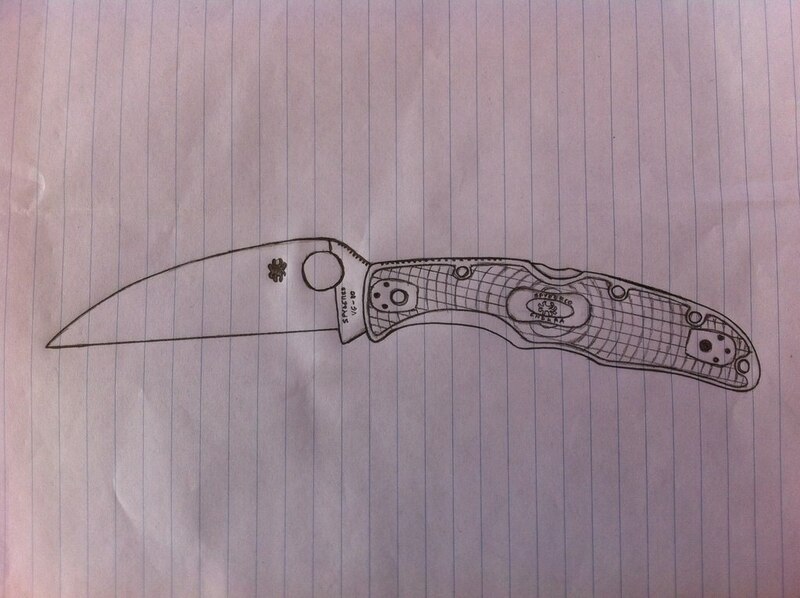 Where is Spyderco on the wharncliffe Endura? Can we get and update or eta? I'd love to see that! The warncliff on the delica is awesome. But it's squatter. The endura is slimmer in profile so I'd love to see how that looks...like a stretched out warncliff? There’s a thread over on BF with some pics of Jazz’s sketch and a prototype Sal was carrying. But I was hoping to get a discussion going over here, I like here much better. I downloaded the pics for drooling purposes, but I’m not sure the pic owners would appreciate me uploading them. Perhaps Jazz and Sal or TazKristi would chime in or post them. Yes, let’s get this talked about here. Better place to hang out. I’d like to post Sal’s pics, but don’t think it appropriate, so here’s the sketch I made up. I think it looks a lot like his proto pics. Thanks Jazz! Gotta mod the drawing with the lamination line if that’s gonna come out in hap40, SB, and V-toku2! I’d buy one in hap40 or zdp189 if it looks like that sketch. I hate the look of the normal endura but love the looks of a good wharnie. Put me down for both a serrated and a hap40. I’d like a PE and SE. I would like a SE and PE please. Will the grind be flat or saber? Looks flat to me in the proto pics, bro. I'd figure that since it's VG10 - SEKI CITY, the lettering would be perfectly lined up with the perpendicular line through the spydie hole lol. The Delica Wharncliffe is a great knife! I've been using a Hap40 version as my EDC. I prefer Endura's because off the larger handle size, hopefully a Hap40 version drops first up! I'd love it if Spyderco released a Maxamet (or similar) version because the Wharncliffe shape is perfect for hard use, a high wear steel version would be a working man's best friend!!! "If you won't stand for something, you'll fall for anything"
Your idea is cool and excellent!